How is this one coming along? Any visible progress anybody can share? Tnexster wrote: How is this one coming along? Any visible progress anybody can share? Walk by it everyday. There's some work being done in the insides. No visible progress on the exterior though. I have the pleasure of seeing it every day from my office. The last two weeks they have been removing the dirt and overgrown vegetation from the rooftop. There's a front-end loader moving dirt as I type. I have yet to see people moving around in the tower itself, thought. It appears to be pretty well gutted. I really hope they bring back the pinstripe lighting. Though, changing them to LED with the ability to change colors. Staying white most of the time as its signature and changing for holidays and events. That said, I have loved what BofA has been doing with it's lights this week. If anyone hasn't seen it, it has been doing color displays and motions using the full range and then pausing for several minutes at a time on its signature green. I don't know if it is just temporary or what it will be from now on, but I love it. I am also hoping they do something creative with the lighting. I would think in this day and age they would, since it is residential and hotel maybe they would do something that was not so bright and more subdued. I'm in the Kirby next to the Drever and have a pretty great view of the terrace. They've torn out all the planters and overgrowth that was there pretty quickly over the past couple of weeks. ...just imagine the smart downtown soirees that'll happen on that terrace. High enough to give a city view, low enough to spot something on the street. The style of 1950s rat-pack entertaining is coming back to Dallas, such a good thing because Dallas needs to be a little more buttoned up. theoryNine wrote: I'm in the Kirby next to the Drever and have a pretty great view of the terrace. They've torn out all the planters and overgrowth that was there pretty quickly over the past couple of weeks. I can see my apartment in the first picture. Hope you're not watching me. Wow that is great, thanks for the pics. Nice to see some action resuming here. Jay9398 wrote: I can see my apartment in the first picture. Hope you're not watching me. The reactivation of this building will have a tremmendous impact on the street environment of downtown. I'm also excited to see what they will do with the lighting, it's been a black hole in the skyline for so long. ContriveDallasite wrote: The reactivation of this building will have a tremmendous impact on the street environment of downtown. Yes, I can't wait. The problem with these big construction projects is that, while the end product will tremendously help the city, the construction process creates this nasty dead space for a year or so. That article says they are seeking a grocery store concept! Yes, please! Oh, I know they had considered it a good while back but I thought they had dropped it from the plans. Right now the signs just say retail/restaurant. I really hope the article is correct and they're looking at grocer options again. There's a Downtown Residents Council meeting happening at the Drever this coming Thursday. If I make it I plan to ask if they're still looking into a grocery option, as well as what the external lighting situation will be. I remain really ambivalent about this project, it has a fortress like quality that I don't think translates to rental, at least without a street life component that kind of justifies the compound feeling like say the Ritz. I just don't understand the market, so many units, rental only, it will have to demand some of the highest rents in Dallas despite its meh location which will demand high security. I don't they can have it both ways, either it becomes a secure compound that does nothing for the street life and commands the rents they need from very affluent downtown workers or they have to have affordable rents and cut corners. And if you are going to live in a very expensive compound why not just move to Uptown or Victory? John, I think part of the appeal is going to be this mixed-use middle-of-the-city (Elm and Akard) lifestyle that you can't even get in Uptown. Having lived in the Kirby, I can see how people want that gritty urban feel, especially when there's a hotel and retail component attached. Not saying it'll be a 24/7 destination, but this building has downtown anchor potential, even more so than the Statler, which is my favorite downtown building. The Butler wasn't going to work either. John, downtown in general has had a massive increase in rental units with many of the new conversions completing plus more that are on the way. With that in mind it seems as though you are not giving downtown the credit it deserves, One Dallas Center and the LTV Tower along with others already command high rents and do not seem to be struggling. As a matter of fact rents seem to have increased downtown as of late. Plus there is a huge influx of jobs in the area including the massive headquarters in Frisco/Plano just down the DNT, so I do not see why there would be doubt in The Drever's success unless there was a sudden economic downturn which I still don't believe would ruin this project. lakewoodhobo wrote: John, I think part of the appeal is going to be this mixed-use middle-of-the-city (Elm and Akard) lifestyle that you can't even get in Uptown. Having lived in the Kirby, I can see how people want that gritty urban feel, especially when there's a hotel and retail component attached. Not saying it'll be a 24/7 destination, but this building has downtown anchor potential, even more so than the Statler, which is my favorite downtown building. Not only do you get the 'middle of the city' lifestyle, you get it without as much of the party scene as Uptown. If you live in Uptown and want to be 'in the middle of it all', there's a good chance that you'll have to suffer through drunken party goers on the weekends. Downtown also has better DART rail access, convenient access to the new Oak Cliff streetcar, as well as access to the MATA trolley. I think there are enough compelling reasons to pick Downtown over Uptown, and, by the time this building opens, there will be even more to do in the area. The party scene will not leave Uptown, but it will certainly calm down, or more accurately, grow up. I was on Main Street on Saturday afternoon and it was bustling with people from end to end. The Statler and the other hotels will come on line soon, and add fuel to fire. By the time the Drever is done, I expect that the neighborhood service businesses will have arrived, and EMC will be a fairly complete and desirable neighborhood. I am not knocking Uptown or Victory, but they are bright, clean, new places-- the vibe is upscale and trendy. EMC is a much denser place with a more authentic urban feel. All of the buildings have a history and stories to tell. Office rents are much lower, which opens doors to small businesses and family businesses that could never go to Uptown. It will be a very different market with a unique style and its own fans. For those people (and I believe there are many), the Drever will be one of the neighborhood icons. JohnMcKee wrote: I remain really ambivalent about this project, it has a fortress like quality that I don't think translates to rental, at least without a street life component that kind of justifies the compound feeling like say the Ritz. I thought the exact same thing about the LTV conversion, and it seems to be doing pretty well (anecdotally only; I have not checked occupancy rates or anything). This statement is hopeful only, but The Drever should be the spark to that area of downtown that LTV Tower, the Mosaic, and Republic Center currently don't have. I agree, somewhat, with JohnMcKee's observation of a "fortress" and hope The Drever adds street life to our side of the Main Street District / Thanksgiving Commercial District. The ground-level work currently being done to Thanksgiving Tower and adding three restaurant tenants should be a boost to foot traffic, too. I actually think changing the retail focus to ground level only was a good idea. I don't believe the market was capable of supporting multiple levels of retail in the original proposal, and the last thing we need are more empty store fronts. Filling the ground level will be key. While there is one side of this building (West) that is hostile to the street, the other three actually interact fairly well. Hopefully the aesthetic changes are enough to make them appealing. I tend to believe it'll work out well. Just a quick update from the meeting over the Drever the other day: they have confirmed that they're still working on a grocery component for the building, so it has not been cut from the plans. Trader Joe's is popular and trendy, and about the right size. I still do not understand why Eatzi's is kept in the deep freeze - are they just scared to try another expansion?!?! I'm mean, like, the mistake was opening a bunch of stores in a bunch of place unfamiliar with the brand. The Drever would be perfect for Eatzi's. That's great news! I heard a rumor awhile back that Trader Joe's was considering the empty retail in The Merc fronting Ervay, but I'm not sure that space is suitable for a grocer. tamtagon wrote: Trader Joe's is popular and trendy, and about the right size. I still do not understand why Eatzi's is kept in the deep freeze - are they just scared to try another expansion?!?! I'm mean, like, the mistake was opening a bunch of stores in a bunch of place unfamiliar with the brand. The Drever would be perfect for Eatzi's. Eatzi's is the perfect format for the Drever or even Corrigan Tower (their renderings showed Royal Blue as a dream tenant) but as long as Phil Romano is invested in Trinity Groves, he will use Eatzi's as leverage to attract that next office/hotel/apartment investor there, so don't count on seeing Eatzi's downtown anytime soon. dukemeredith wrote: That's great news! I heard a rumor awhile back that Trader Joe's was considering the empty retail in The Merc fronting Ervay, but I'm not sure that space is suitable for a grocer. Yeah, I agree the Merc space is now hampered by the office tenant finish out. It's not very big and it's shallow last I heard so I don't imagine much of anything significant can take that space on. Maybe a fast casual business aka Subway or an office space for something like a State Farm or an Enterprise Rental Car. Nothing that would require significant back office or kitchen space. Pop-Up retail would work there or maybe something as easy as a Bike shop. If they would drywall it and put in outlets etc they could try for a scheduled pop-up retail program. Before the architecture firm signed the lease it could have had two fairly cool two story retailers. H&M or something like that would have been good there but again unless they can assign parking those guys won't even sniff around those spaces. Once the numbers are better that firm could move and better retail could always materialize later. It's great news to hear the Drever is still going for grocery but I won't applaud anything until I see the signage up on the building. While I don't think they have any stores in the US, a Zara Home (or something comparable) would be perfect across from Neiman's. I went in a four story Zara Home in Paris, and it wasn't very deep at all. 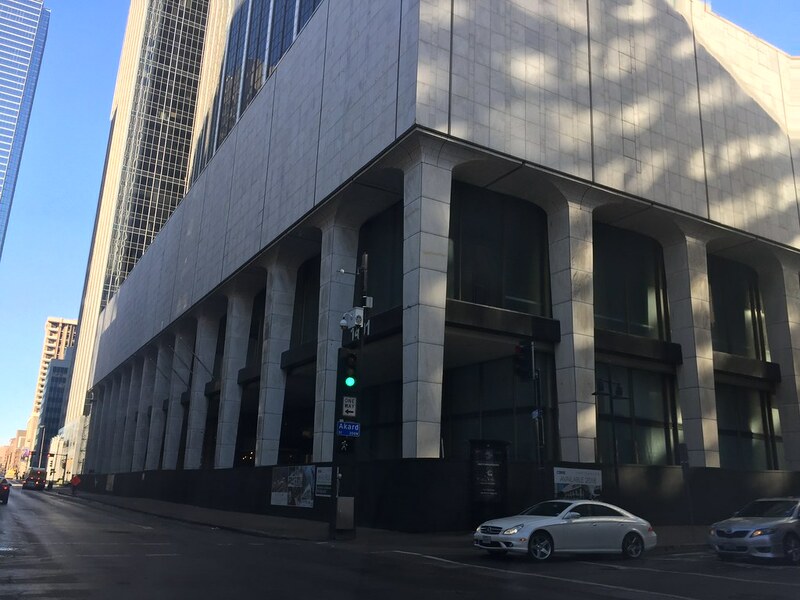 Drever Capital Management announced Thursday the Thompson Hotels group — the brand from Two Roads Hospitality — will operate a boutique hotel as part of the redevelopment of the former First National Bank Building in the city's central business district. Now that's fantastic news! Thompson is an excellent brand with select locations. Their newest property in Nashville has been a big hit since opening in October. Is this really happening to the Drever? Are these updated plans for the Drever and adjacent building? I hope we get a SMG and Macys! Those are old concept renderings and somewhat bush league. Conceptual renderings never have premise signage of real busineses unless a lease has actually been executed. I believe these came out when KPMG was looking for a new home hence their logo at the top of the building. Driver has significantly scaled back the redesign. The facade for the most part will look as it does now. Is there any work being done on this one? Seems to be very quiet when I go by. I really hope this one picks up some steam ASAP. It still seems like it has a long way to go and I never really get a sense of a lot of activity going on. That said, it is a large project and I know a lot was done before. I often felt the same when passing the Statler, but that one has been making it's way. I live across the street. There is a lot going on, mostly inside the podium right now so it's not terribly obvious. Jay9398 wrote: I live across the street. There is a lot going on, mostly inside the podium right now so it's not terribly obvious. As ArtVandelay mentioned a few posts above, the exterior isn't going to change very much. The link to the 5G Studio design shows the studio's work for a previous (re-)developer of the building. It was not selected at the time and is not the design that will be used now with this current developer. I do wonder how they will tackle the lighting scheme. I imagine an upgrade might be in order behind all those opaque vertical panels. Can't recall if I read anything about that. . . The head of the project took questions at the Downtown Resident's Council meeting last month. I told him my bedroom window faces the building and asked if I should buy black-out drapes. He wouldn't confirm anything on the lighting scheme. That building was VERY bright when turned on previously. I also have concerns about the plan for valet parking on the Akard side. In that short block you already have Akard narrowing by one lane and changing to one way, the 1505 Elm Valet across the street, and very heavy foot traffic from Akard Station. Don't get me wrong, I'm thrilled that the building is going forward, especially since it went into foreclosure just a year ago. Those are just my concerns as a neighbor and downtown resident in general. A post from November on the Downtown Dallas Neighborhood Association's Facebook page says plans still call for 130,000 square feet of retail. Also talks about the grocer rumors, discussed above. First I've seen that number — that would be a lot! Bryan Dawsey at the Downtown Residents Council Meeting giving an update on 1401 Elm high rise, an exciting development underway in the center of downtown Dallas. 50 stories tall with 130,000 square feet of retail and a rooftop observation deck. Is a grocery store in its future? 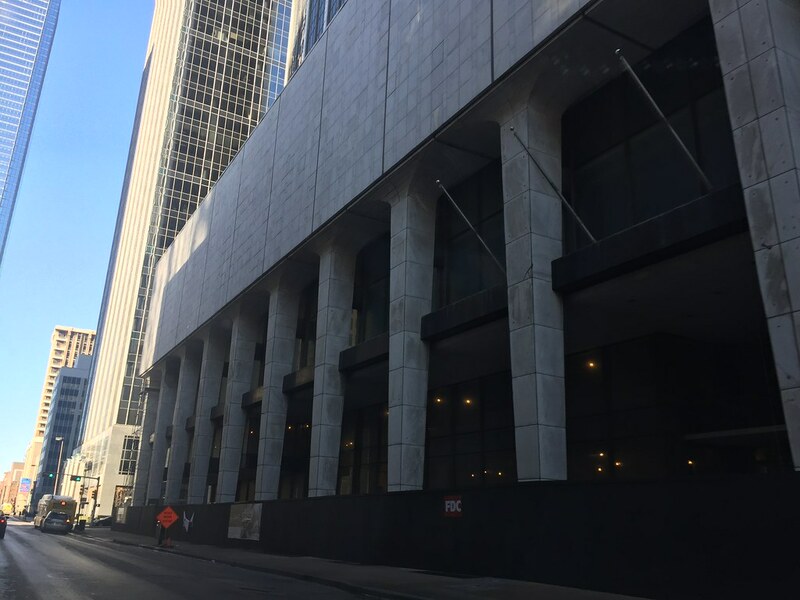 dukemeredith wrote: A post from November on the Downtown Dallas Neighborhood Association's Facebook page says plans still call for 130,000 square feet of retail. Also talks about the grocer rumors, discussed above. They are crazy if they don't put in LED lighting into the stripes, lighting shows would make it one of the most iconic buildings in Dallas. The number appears to be 40,000.